How Do I Clean Up A Broken Compact Fluorescent Bulb? Compact fluorescent light bulbs are widely praised for their energy-efficiency and relatively low price points. However, unlike traditional light bulbs, they pose a specific health risk to humans and pets. Most compact fluorescent light bulbs are loaded with mercury vapor and mercury is poisonous — even in very small doses. And, unfortunately, sometimes light bulbs break, releasing toxins into the air. To assist homeowners in Franklin , the EPA published a series of CFL-handling guidelines on its website under the heading “How Should I Clean Up A Broken Fluorescent Bulb?“. Using rubber gloves, place glass fragments and “powder” in a glass jar, or sealed plastic bag. In addition, the EPA says to throw out all clothing and bedding that has come into direct contact with a broken bulb. You should not attempt to wash items such as these. They may contain mercury fragments that could contaminate your laundry machines and/or your sewage system. 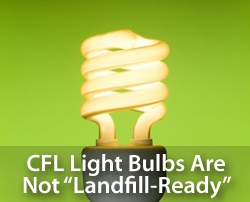 Lastly, make sure to keep your CFLs separate from your regular trash; they’re not meant for landfills. Compact fluorescent light bulbs should be recycled with a verified waste management company. You can find one at http://earth911.com. By Phillip Cantrell|2015-02-11T15:01:56-05:00June 27th, 2011|Agent Blog, Around The Home, Consumer Blog|Comments Off on How Do I Clean Up A Broken Compact Fluorescent Bulb?